When Amazon announced the release of the new Kindle for 2016 a couple weeks ago, one of the new features they mentioned in the press release that didn’t get much attention is the ability to export notes to email. In fact the export notes option is already enabled on Kindle ereaders. I don’t remember it being part of the last 5.8.1 update; perhaps they are rolling it out with the new Page Flip feature because that’s when I first noticed it showing up. 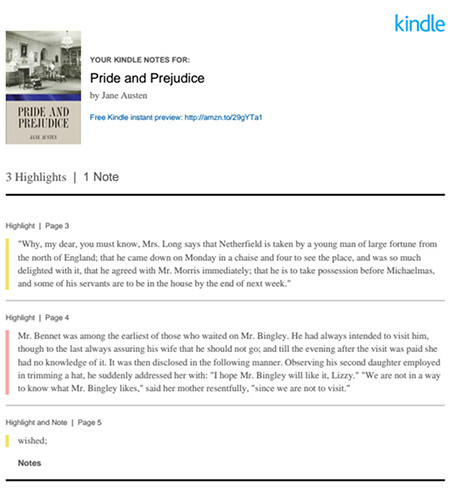 There are already a number of ways to export Kindle notes and highlights, but this new email option is a lot more convenient because it can be done directly from the Kindle itself. The way it works is you get an email with a PDF copy of your notes and highlights, plus a CSV file so you can edit and reformat the notes if you want to. To send the notes email, just open a book on your Kindle and hit the settings menu button to access the Notes list. From there you can hit the export notes button at the bottom. This is a handy feature to have if you like reviewing the notes and highlights you’ve added to your Kindle books. It’s a definite step up from the previous method of having to deal with the Kindle’s awkwardly-formatted My Clippings file. Indeed. I forgot to mention that it doesn’t work on sideloaded content, or even stuff that you’ve sent to your Kindle through Amazon. You can get Page Flip to work with sideloaded content, however, if it’s converted to KFX with a Calibre plugin. Exporting notes and highlights, plus flashcards, is already available with the Fire tablets and Kindle apps. Also, the feature works with personal documents too. I checked the feature with the Kindle and couldn’t find it with the latest firmware. However, Amazon promised to extend the feature to the Kindle e-readers soon. Either way, it is easy for me to get my notes emailed through the Fire HD 8 I use, as both personal docs and purchased books sync across all Amazon devices. In the past all notes made with a Kindle e-reader was stored locally via the ‘My Clippings’ file. On the plus side it does work with library books borrowed through Amazon. I just need to start remembering to download notes before returning books. OOps – GO TO between less and greater symbols doesn’t show. How about [Go To], Notes tab? I can’t get it to work with my ios APP on ipad. i just get a message that an email account isn’t setup. I have no problems on my voyage. Any ideas? Same issue – “no email account is setup” – and I can’t find any way to set up an account. Sam issue here I have no problem exporting notes on my Kindle with Amazon purchased books but with the iOS app it says I don’t have an email account setup which I do. Sadly this still hasn’t been fixed. I see the Export Notes but when I select that, it replies that it is sending. I never receive them. Where do they go? Not into my Amazon email. Does anyone know if there is a limit of notes that can be exported? I only received half of the notes I made. There’s no limit on notes but some publishers and authors limit the amount of highlights that can be exported. Using the menu button, notes, export, Send works for most documents…however when I get a document from “send to my kindle” app the export button does not show up. Is there a remedy for this? the PDF and SCV files I received with the notes I exported from paperwhite turns out “nothing” in the content other than the books cover on the PDF doc. And nothing on excel at all other then the name of the book. Tried many times and tried on different books. These are all ebooks i got from amazon directly. Hum maybe stupid question but How do you access to the kindle e-mail content (to get the raw *.pdf or *csv)? It does not seems present on Amazon website itself (june 2018). I enjoy the fact that higlights can be exported this way, but what I really miss in the format of the current highlight export (and also the notebook format of Amazon Kindle online) is that it does not include a timestap (the time and date the highlight was made). This information is available in My Clippings, but cannot currently be exported. For me it is really valuable to be able to retrace when exactly I generated the highlights, I want to be able to keep track of what books I read at what time.